Acknowledged author Paul Keat wrote Managerial Economics (7th Edition) comprising 624 pages back in 2013. Textbook and etextbook are published under ISBN 0133020266 and 9780133020267. 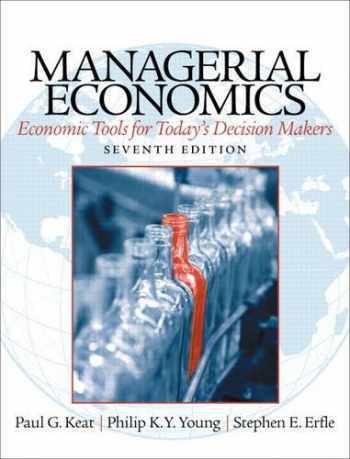 Since then Managerial Economics (7th Edition) textbook received total rating of 4 stars and was available to sell back to BooksRun online for the top buyback price of $73.07 or rent at the marketplace. Directed primarily toward undergraduate/MBA students in Economics, this text also provides practical content to current and aspiring industry professionals. This text will excite readers by providing a more linear progression, while proving the consistency and relevance of microeconomic theory. The Seventh Edition welcomes a new co-author, Stephen Erfle of Dickinson College, who has contributed many revisions and improvements to the quantitative sections of the text, as well as provided a major addition: the use of Excel in the presentation of many of the numerical and graphical illustrations presented throughout the text. To strengthen readers’ ability to use Excel—a critical skill in today’s job market–new Excel Applications (Excel Apps) allow readers to turn the static figures and tables in the text into dynamic illustrations.